Our skin changes naturally with age. Wrinkles, skin discoloration, and blemishes are formed due to a variety of genetic and environmental factors. As we age, our skin naturally becomes thinner, loses fat tissue and firmness, produces less beneficial oils, and reveals the repetitive muscle contractions made over the years. In addition, years of sun exposure begin to break down the skin's defenses. Exposure to sunlight is the most important cause of prematurely aging skin (a process called photoaging) and skin cancers. Exposure to ultraviolet radiation from sunlight accounts for most of the symptoms of premature skin aging, such as discoloration, textural changes, and wrinkles. Lighter skinned individuals are more severely affected. The most important preventive measure is protecting one's skin from sunlight. Wearing sunscreen that blocks UVA and UVB every day can help to protect the skin from damaging sun rays. A healthy lifestyle, including sun protection, a healthy diet and regular exercise, is the most important way to reduce the formation of wrinkles and blemishes. Topical antioxidant products along with retinoids help reduce the appearance of wrinkles and blemishes and protect against sun damage. Chemical peels, dermabrasion, laser therapy, injectable skin fillers, and botulinum toxin injections can be used, depending on the extent of photodamage and skin wrinkles. Hyaluronic acid fillers, derived from avian (rooster comb) or bacterial sources, have become one of the most widely used temporary fillers, lasting 6 to 12 months. They are compatible with all tissue types and do not require an allergy skin test. A newer laser resurfacing technique called fractional ablative laser is milder than traditional ablative methods, but more effective than non-ablative techniques. For some conditions, dermabrasion may be a less costly alternative to laser, and just as effective. Chemical peels remain an effective treatment and vary in depth and effects on the skin. Cosmetic surgery (facelift, forehead lift, and neck lift) can help correct tissue sagging and wrinkles. Several techniques that are faster and safer than traditional methods have been developed. A combination of tailored treatments is most likely to bring the best results. The role of vitamin D in the treatment of seborrhoeic keratoses looks promising, and continues to be studied. However, physical destruction of seborrheic keratoses continues to be the most common mode of treatment. Cryotherapy remains a fast and effective treatment but can discolor the skin and may be painful. Honey is being studied for its antibacterial as well as cosmetic benefits. In cosmetic formulations, it may help to improve the skin's appearance and delay wrinkles. However, these results are anecdotal and not endorsed by the FDA. Epidermal growth factor (EGF), a type of protein, is also being looked at for its role in improving the appearance of aging and wrinkled skin. EGF is found in several "cosmeceuticals," substances that are thought to provide both cosmetic and therapeutic benefits. These products are available without a prescription. Cells divide more slowly and the inner layer of skin (the dermis) starts to thin. 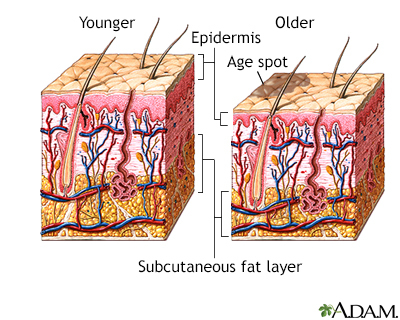 Fat cells beneath the dermis begin to shrink. In addition, the ability of the skin to repair itself decreases with age, so wounds heal more slowly. The thinning skin becomes prone to injuries, bruising, and damage. The deeper layer of the skin, which provides the support structure for the surface skin layers, loosens and unravels. Skin then loses its elasticity (ability to stretch and return to position). As a result, skin sags and forms furrows. Glands that secrete oil shrink (atrophy). This leaves the skin without a protective layer of oil. The skin's ability to stay moisturized decreases, becoming dry and scaly. Frown lines (between the eyebrows) and crow's feet (lines that spread from the corners of the eyes) develop because of repetitive muscle contractions during facial expressions. Gravity causes skin and tissues to sag, leading to formation of jowls and drooping eyelids. UVA affects the deep layers of skin. Most of the ultraviolet rays that reach the earth are UVA. UVA is not as intense as UVB. UVA rays are equally intense throughout the entire day and year. UVA can pass through clouds and glass. UVB is the main cause of sunburns. It mostly affects the outer skin layers. UVB is most intense in the United States between 10 a.m. and 4 p.m. from April to October. Skin damage from UVB can also occur during winter, at high altitudes or in places with snow and ice, which reflect rays onto the skin. Window glass filters out most UVB rays. Long-term repeated exposure to sunlight adds up. This exposure is responsible for the problems of aging skin, including the common skin cancers called basal cell and squamous cell carcinomas. Intense exposure to sunlight in early life is an important cause of melanoma, a potentially aggressive and fatal type of skin cancer. Sunlight damages collagen fibers. Collagen is the main protein that gives structure to the skin. Sunlight also damages elastin. This is another protein in the skin that helps it and the tissue below stay springy and strong. In response to sun-induced elastin damage, the body produces large amounts of enzymes called metalloproteinases. Some of these enzymes break down collagen. The result is an uneven formation of disorganized collagen fibers called solar scars. Repetition of this abnormal skin rebuilding causes wrinkles. An important event in this process is the over-production of oxidants, also called free radicals. Excessive amounts of oxidants damage the body's cells. They can even alter the genetic material of cells and they also contribute to skin cancer formation. Oxidation may lead to wrinkling by activating the specific metalloproteinases that degrade connective tissue. In addition to sunlight, other factors can speed the formation of wrinkles. Smoking produces free radicals in the body. These cause wrinkles and age-related skin problems to develop sooner. Free radicals also increase the risk of non-melanoma skin cancers. Studies suggest that smoking and resulting oxidation produce higher levels of metalloproteinases. Ozone is a common air pollutant. It may reduce the body's vitamin E level. Vitamin E is an important antioxidant that protects cells against the effects of free radicals. Three common types of blemishes are liver spots, purpura, and seborrheic keratoses. Liver spots are also known as age spots, solar lentigos, or sun-induced pigmented lesions. They are flat brown spots on the skin. Despite the name, these blemishes have nothing to do with the liver. Instead, they are common signs of aging. Liver spots are most noticeable on the hands and face. They often increase in number, get larger and darker over time. Their number, sizes, and brownness are determined by skin type, sun exposure, and age. Liver spots are harmless, but they should be distinguished from lentigo maligna, which is a form of melanoma. Liver spots or age spots are a type of skin change associated with aging. The increased pigmentation may be brought on by exposure to sun or other forms of ultraviolet light, or other unknown causes. While they appear as people get older, they are the result of sun exposure from years prior to their appearance. Liver spots do not require treatment, although some people are bothered by their appearance. Trichloroacetic acid (a chemical peel). Tretinoin (Retin A) alone, or in combination with a bleaching agent such as hydroquinone or mequinol (Solage). Tretinoin is a derivative of vitamin A. Gentle freezing with liquid nitrogen (cryotherapy). Laser treatment is effective in eliminating many liver spots in one treatment. Laser treatment may be more effective than cryotherapy and may have fewer side effects. Bleaching creams are widely available, but they are not as effective as a chemical peel. High concentrations of the bleaching ingredient can cause permanent loss of skin color and should be used carefully. Purpura occurs when tiny blood vessels called capillaries break and leak blood into the skin. In older people, the condition is called senile or actinic purpura and is usually caused by blood vessels that break easily. This is usually seen on the forearms and top of the hands. The capillaries appear as flat purplish patches. These patches are called petechiae when they are smaller than 3 mm (about a tenth of an inch). When they are larger than 3 mm, they are called ecchymosis. Purpura looks like a rash that may appear red at first and gradually turns brown or purple. It is also exacerbated by blood thinners, including aspirin. There is no specific treatment for purpura. People with purpura should avoid trauma, including vigorous rubbing of the skin, which may damage the capillaries. Lotions that soften the skin may be helpful. Some doctors also recommend vitamin C, but its effectiveness is unproven. Seborrheic keratoses are common skin disorders in older adults. Their cause is unknown and unrelated to sun exposure. There is a genetic component to sebrorrheic keratoses. These skin growths usually appear on the head, neck, or trunk. They range in size from 0.2 to 3 cm (a little over an inch). They have clear borders and look like they are pasted on the skin. Their appearance can vary widely and are commonly mistaken for skin cancers. Smooth with tiny, round, pearl-like formations embedded in them. Seborrheic keratoses are non-cancerous (benign) though they can look like melanoma because of their sometimes irregular border. A dermatologist (skin doctor) can tell the difference. Because melanomas can hide among seborrheic keratoses, they may go unnoticed without close inspection. Seborrheic keratoses have an even appearance, whereas melanomas often have a smooth surface that varies in height, color density, and shading. In some cases, keratoses cause itching or irritation as they can be rubbed by clothes and appear in uncomfortable areas. Many often scratch at them and pick them off but they inevitably grow back. Seborrheic keratoses can be removed with surgery, laser, freezing, or scraping. Vitamin D3 ointment is also being tested as a treatment. Vitamin D3 ointment is also being tested as a treatment. Medical researchers estimate that most skin damage begins in childhood and adolescence as a result of intermittent, intense sun exposure that causes severe sunburns. Most people over age 70 have at least one skin disorder, and many have three or four skin disorders. Skin changes are normal as a person ages. But a long life is not the only factor that determines whether a person develops skin problems. Family history, genetics, and lifestyle choices all have an impact on the onset of aging-skin symptoms. Doctors classify skin types, also called skin phototypes (SPTs), based on the sensitivity to sunlight. SPT ranges from SPT I (lightest skin plus) to SPT IV (darkest skin). Skin types I and II are at highest risk of photoaging skin diseases, including cancer. Early aging of skin from sunlight exposure can affect people of all skin shades. The common belief is that women are at greater risk of wrinkles than men. Evidence suggests, however, that given the same risk factors, men and women in the same age groups have the same risks of skin photoaging. Some studies report that men are more likely than women to develop non-melanoma skin cancers. The skin of smokers in areas of their bodies not exposed to sunlight also seems to age more rapidly compared to nonsmokers in the same age group. Heavy smokers in their 40s often have facial wrinkles more like those of nonsmokers in their 60s. Smokers tend to have thinner skin, more and deeper wrinkles than nonsmokers. Cigarette smokers are also more prone to skin cancers, including squamous cell carcinoma and giant basal cell carcinoma. Research has found that women who smoke have much lower levels of vitamin E secretions in their skin. Vitamin E is an antioxidant that may help protect the skin from sun damage. The best long-term prevention for wrinkles and blemishes is a healthy lifestyle and protecting the skin against sun damage. A diet with plenty of fresh fruits and vegetables and whole grains along with healthy oils (such as olive oil) may protect the skin from damage by free radicals. This is because these foods have high levels of antioxidants. Daily exercise keeps blood flowing, which brings oxygen to the skin. Oxygen is important for healthy skin. Smoking increases wrinkles. Quitting smoking prevents many health problems not just unhealthy skin. Exposure to secondhand smoke is also dangerous to overall health and is damaging to skin. Use a sunscreen daily that protects against UVA and UVB rays with a sun protection factor (SPF) rating of 30 or higher. Wash your face once in the morning and once at night. Also wash after sweating. Perspiration can irritate the skin. Avoid washing too often because it can strip the skin of oil and moisture. Use lukewarm water. Chlorinated water, particularly at high temperatures, can cause wrinkles to form. Wash your face with a mild soap that contains moisturizers. Try not to use deodorant soaps. These have substances that can irritate the skin. Pat the skin dry and apply a moisturizer. Always apply sunscreen, even when going outdoors for short periods. Applying a cream containing a UVA and UVB sunscreen every day helps prevent skin damage caused by the sun. A sunscreen with SPF 30 or higher is best. Do not drink alcohol within 3 hours of bedtime. Alcohol increases the risk of leaks in tiny blood vessels. This can lead to sagging and puffiness. Leaking increases when you are lying down. Use sunscreen that protects against both UVA and UVB rays. Read packaging label to learn when and how to apply sunscreen. Apply sunscreen in thick layers 15 to 30 minutes before exposure. Reapply after being in the water or every 2 hours otherwise. Avoid sun exposure during peak hours, generally considered between 10 a.m. and 4 p.m., when the sun's UV rays are the strongest. Wear clothing to protect against the sun. This is in addition to applying sunscreen. Wear a long-sleeve shirt, long pants, and a hat with a wide brim. You can also buy special clothing that absorbs UV rays. Avoid surfaces that reflect, such as water, sand, concrete, and areas that are painted white. Such surfaces can bounce back UV rays. Clouds and haze do not protect against UV rays, and can even make UVB rays stronger. Ultraviolet intensity depends on the angle of the sun, not its heat or brightness. The dangers are greater the closer to the start of summer. For example, in the northern hemisphere, UV intensity in April (two months before summer begins) is equal to that in August (two months after summer begins). The higher the altitude, the quicker you will sunburn. Do not use sun lamps and tanning beds (salons). Spending 15 to 30 minutes at a tanning salon is as dangerous as a day spent in the sun. Many products and methods are available to improve the appearance of skin. Some are for home use while others must be administered by a doctor. Occlusives, such as petroleum jelly, prevent water from evaporating from the skin. Humectants, including glycerin, act by pulling water up to the surface of the skin from deep tissues. People with oily skin should use humectant moisturizers. Other products contain mixtures of fatty molecules (lipids), such as monolaurin. These help restore the skin's natural barrier against moisture loss and damage. Most moisturizers contain combinations of these compounds. They usually have other ingredients, such as alpha hydroxy acids, sunscreen, collagen, and keratin. Collagen and keratin leave a protein film and temporarily stretch the skin, which may reduce wrinkles. Follow the instructions on the package about how to use the product. Under-eye products are applied with light dabbing to stimulate absorption of the cream into the skin. Cosmetics can be effective in masking the signs of aging skin, including wrinkles and age spots. Cosmetic can also slow water loss from the skin. Many cosmetics contain sunscreen. Apply moisturizers before foundation. If reddish discoloration is extensive or the skin is sallow, tinted moisturizers may be helpful and can be worn alone or under foundation. Caking on make-up causes cracks at the wrinkle lines and increases the appearance of aging. Cover large areas of the face with a moderate-coverage foundation that has a matte or semi-matte finish. Facial powder reflects light and thus minimizes wrinkles. People with dry skin should not use facial powder, though. Green neutralizers mask red lesions. Yellow will camouflage dark circles and bruises. Mauve (a purplish-pink color) helps neutralize sallow skin or yellowish blemishes. A white, pearled base helps minimize wrinkles. Blushes and color washes can help conceal the spidery network of dilated capillaries on the nose and cheeks. Powder blushes blend easily on top of foundation. Powder eye shadows applied on top of a moisturizer are better than cream-based shadows. Light-colored shadow, applied along the upper eyelid crease and above the iris (the colored part of the eye) is best for offsetting the appearance of deep-set eyes. Slightly deeper shade of the same color can be applied to the lower part of the eyelid and drawn out to the corner. Antioxidants are substances that counter the effects of free radicals. Exposure to sunlight reduces antioxidants in the skin. But these antioxidants can be replaced. Antioxidant ointments, creams, and lotions may help reduce the risk of wrinkles and protect against sun damage. Unlike sunscreens, they build up in the skin and are not washed away, so the protection may last longer. Selenium, coenzyme Q10 (CoQ10), and alpha-lipoic acid are antioxidants that can be applied to the skin. Evidence of their benefit is limited and more studies in humans are needed. More commonly used antioxidants are described below. Your dermatologist can tell you which product is right for you. Vitamin A is important for skin health. UV radiation leads to vitamin A deficiency in the skin. Topical (applied to the skin) vitamin A products have been researched and approved for treating skin problems due to aging. Products include natural forms of vitamin A (retinol, retinaldehyde) and chemicals related to vitamin A called retinoids (adapalene, tretinoin, tazarotene). These products help repair skin damage due to sunburn and natural aging, such as fine wrinkles, liver spots, and rough skin. It may take months before the skin shows improvement. Side effects include redness, scaling, burning, and itching, which can be treated with moisturizer or a mild corticosteroid cream. Sunscreen needs to be applied during the day because vitamin A products can cause the skin to be sensitive to sunlight. Topical retinoids are the mainstay of treatment for people with mild to moderate photoaging. Retinoids are a class of naturally occurring or synthetic compounds related to vitamin A, also known as retinol. Clinically, they reduce the appearance of fine lines, improve skin texture, correct tone and elasticity, and slow the progression of photoaging. Tretinoin, or all-trans-retinoic acid, is the most widely investigated photoaging therapy. Tretinoin 0.05% emollient cream (Renova) and tazarotene 0.1% cream (Tazorac or Avage) are the only 2 retinoids approved by the US Food and Drug Administration (FDA) for this indication. Other topical retinoids used off-label for photoaging include adapalene, a synthetic derivative available by prescription, and retinol, which is found in many antiaging cosmeceutical products. These products are also approved to reduce acne lesions. Topical retinoids may cause irritant reactions, such as scaling, redness, burning, and dermatitis, limiting patient compliance. Retinoids should be initiated at the lowest effective dose to minimize adverse effects. A minimum of 4 months use is necessary before benefits are appreciated. Moisturizer may be applied over some forms of these retinoids to avoid excessive irritation. They should be applied at bedtime as most retinoids are not stable in sunlight. Although tazarotene is the only topical retinoid with a category X designation, other topical retinoids are not recommended during pregnancy (class C) or lactation. Women who are pregnant should not use any product related to vitamin A. Oral isotretinoin is known to cause birth defects. Topical tretinoin may also cause birth defects. Vitamin C, or ascorbic acid, is a strong antioxidant that may also help rebuild collagen. Though there are many vitamin C products, none has been approved as a treatment for age-related skin conditions. Most research on the effects of antioxidants on the skin has used this vitamin. In laboratory studies, vitamin C seems to reduce or even protect against damage to skin cells caused by UV radiation. Vitamin C also seems to help skin cells survive after exposure to UV rays. Vitamin C is best used in the morning along with sunscreen. Other antioxidants are being researched for their value in skin protection. Like vitamin C products, none of these antioxidants has been approved as a treatment for age-related skin conditions. Most of these products contain very low concentrations of antioxidants. In addition, the antioxidants are not well absorbed by the skin and have only a short-term effect. New ways of getting the ingredients into the skin may offset some of these problems. Vitamin E, particularly alpha tocopherol cream (a form of vitamin E), may decrease skin roughness, length of facial lines, and wrinkle depth. Niacinamide, a B complex vitamin, may have a positive effect on wrinkles and may be beneficial for wrinkles around the eyes. Pomegranate and soy extracts may help rejuvenate aging skin. Aloe, ginger, grape seed extract, and coral extracts contain antioxidants and are promoted as being healthy for the skin. However, evidence of their effects on wrinkles is weak. Honey is being studied for its antibacterial as well as cosmetic benefits. In cosmetic formulations, it may help to improve the skin's appearance and delay wrinkles and can act as a moisturizer. Exfoliation (resurfacing) is one of the basic methods for improving skin and eliminating small wrinkles. It involves removing the top layer of skin to allow growth of new skin. Home exfoliation methods include simple scrubs and special creams. Strong exfoliation methods may not be suitable for people with dark skin because scarring or discoloration may result. These products can lead to post inflammatory hyperpigmentation, which leaves the skin with more dark discoloration rather than eliminating the dark areas. If you are not sure of a product, talk to your dermatologist. These involve using an abrasive material to remove the old top layer skin so that new skin can grow. Types of abrasives include sugar or salt grains, ground fruit pits, aluminum oxide particles, and tiny plastic beads (also called polyethylene beads or microbeads). Microbeads are the mildest scrub because the particles are smooth and round. Ground fruit pits and aluminum oxide are the strongest scrubs because their particles have rough edges that may injure the skin. The abrasive material is mixed with a base, often a cream or cleansing fluid. Scrubs can worsen certain skin conditions such as acne, rosacea, or broken blood vessels. Scrubs are also not suitable for sensitive skin. Alpha hydroxy acids (AHAs) ease the shedding of dead skin cells and may even stimulate growth of collagen and elastin. Most alpha hydroxy acid products contain glycolic acid. Skin care products are also made from polyhydroxy acids (PHAs) and beta hydroxy acids (BHAs) such as salicylic acid. Research suggests that PHA products may cause less skin irritation than AHA or BHA products. Acid concentrations in over-the-counter AHA preparations are 2% to 10%. Prescription strength creams contain at least 12% glycolic acid. Glycolic acid peels of 30% to 70% concentration may be administered in a doctor's office. Treatment is done weekly or monthly. Results of AHA treatment vary. Side effects can include skin burn, itching, pain, and scarring. AHA may increase the chance of sun damage to the skin, even at concentrations as low as 4%. Side effects can last up to a week after a person stops using the product. Experts advise that for home use, AHA concentrations of 10% or less are suitable. AHA peels of up to 60% are available without a prescription. These concentrations should be used only under a doctor's supervision. If side effects occur, stop using the product right away. When using these products, avoid sunlight and use sun protection as sun exposure may lead to postinflammatory hyperpigmentation. Certain copper-containing compounds may protect skin. This is because copper is an antioxidant. Copper peptides may also help repair skin because it helps the skin grow collagen and elastin. Copper is harmful when there is too much in the body. Follow instructions on the package when using these products. Check with your dermatologist if you are not sure which product is right for you. Many other peptides are found in over-the counter skin preparation. Their suggested mechanism of help is in the production of proteins in the skin that reverse or repair damage. This is a medication prescribed to treat precancerous and cancerous skin problems. It also seems to improve the appearance of skin damaged by the sun. Problems that may be corrected include wrinkles and spots. The effects may be similar to those of laser therapy. When using fluorouracil, your skin will get very red and inflamed and will be more sensitive to the sun. These creams are usually used for 2 to 4 weeks. This is a type of protein (or polypeptide). It is being looked at for its role in improving the appearance of aging and wrinkled skin. EGF is found in several "cosmeceuticals," substances that are thought to provide both cosmetic and therapeutic benefits. Many herbal products and supplements are advertised as being healthy for the skin. The FDA does not regulate herbal remedies and dietary supplements. Manufacturers and distributors do not need FDA approval to sell their products. Any substance that affects the body's chemistry can produce side effects that may be harmful. Check with your health care provider before using herbal products and supplements as they may cause unwanted side effects or interact with other medicines you are taking. St. John's wort (Hypericum perforatum) is an herbal remedy for depression. Kava (Piper methysticum) is an herb promoted to calm nerves and reduce stress. Yohimbe (Pausinystalia yohimbe) is promoted to treat erectile dysfunction. Essential oils in many aromatherapy products can trigger photosensitivity. These include citrus oils (grapefruit, lemon, lime, orange, and bergamot), cumin, ginger, and angelica root oils. A number of different botanical extracts are found in over-the-counter skin creams. However, the benefit of most of these for human skin changes has not been validated in scientific studies. For people in their 30s, a simple chemical peel is often sufficient. After age 40, collagen or fat implants may be beneficial. For age 50 and older, doctors recommend laser resurfacing based on individual needs. Laser surgery may be used for deep lines (such as those around the mouth) and chemical peels for the rest of the face. For enhancing the eye by correcting droopy eyelids, bags, and a "sinking" brow, combinations of an eyelift (blepharoplasty), botulinum toxin injection, and laser resurfacing may be used. Superficial, medium, or deep resurfacing can be considered. The doctor will ask about your medical history and medicines you take. This is because the different resurfacing methods cannot be done if you have certain medical problems or take certain medicines. For example, a chemical peel cannot be done on people who have severe liver and kidney disease, HIV, or immune system conditions. It should be avoided in those with open wounds or active infection. Candidates should have proper expectations for results, and be willing to endure some burning or stinging sensations on the face. After any resurfacing procedure, follow instructions about avoiding sun exposure. Apply sunscreen of SPF 30 or greater to protect your new skin from UV damage. Chemical peel is also known as chemosurgery. It helps restore wrinkled, sun damaged, lightly scarred, or blemished facial skin. A chemical peel removes the top layers of skin so that the new skin that grows back is younger-looking. Chemical peels are thus referred to as rejuvenating peels. The procedure is very effective for the upper lip, but it cannot be done around the eyes. A partial peel is often done along with a facelift. A chemical peel can also be combined with topical antioxidants such as tretinoin and vitamin C. With advances in other resurfacing options, chemical peels are becoming less common. While chemical peels tend to be less expensive than laser, they are less effective and usually require more treatments. Your doctor will evaluate your skin type before recommending the type of chemical peel for you. This is because there are different types of acids and peeling methods as well as depth of treatment. The skin where the chemicals will be applied is thoroughly cleansed to remove bacteria. Chemical peels may be superficial, medium depth, or deep. Medium depth peels or more likely to be performed for moderate photoaging, mild acne scarring, or actinic keratosis. Depending on the depth of the peel, you will receive pain medication. A day or two before the procedure, you may also receive an antibiotic to prevent infection. Chemicals are applied to the skin. These may include trichloroacetic acid, high concentrations of alpha hydroxy or beta hydroxy acids, or various combinations of the three. In some cases, tretinoin or alpha hydroxy is applied 4 to 6 weeks before, and starting one day after the peel. This improves the effects of a peel and reduces the risk of skin discoloration. A crust or scab forms within 24 hours after the chemical is applied. You will receive instructions on how to care for your skin after you go home. Follow the instructions exactly. Doing so helps your skin heal and prevents complications. During healing, the visible skin is deep red but gradually lightens as it regenerates. Healing time varies depending on the depth of the peel. For peels that remove the top layer of skin, healing takes between 1 to 4 days. For deeper peels, it may take up to a year for the skin to recover fully. The most common complication of chemical peels is changes in pigmentation. Complications are more likely in people with darker skin types and with sun exposure following the procedure. In many cases, peels are done in a series separated by 6 to 8 weeks. A test spot may be performed to check on one's response before applying treatment to the entire face. Dermabrasion affects deeper layers of skin than chemical peels. It is often used to treat scars due to acne, surgery, or injury. For aging skin, dermabrasion is effective for wrinkles on the upper lip and chin, but it cannot be used around the eyes. It can also treat tattoos and burns effectively. Some doctors use dermabrasion instead of lasers for darker skin. Although laser methods have become more popular, it is less costly than laser resurfacing with similar outcomes. Your doctor will determine if your skin type and problem area are suitable for dermabrasion. Be aware that dermabrasion may not completely improve skin problems such as wrinkles and sun damage. Standard dermabrasion uses a rotating wire brush that removes the top layers of a person's skin. As with chemical peels, dermabrasion removes the upper layers of skin, leaving the underlying layers exposed. After the procedure, the treated skin forms a scab. For full-face dermabrasion, a local anesthetic or general anesthesia may be used. This is a gentler, more superficial form of dermabrasion. There are two methods. One uses a handheld device that streams tiny crystals to polish the skin. An attached vacuum removes the used crystals and exfoliated skin. Another method uses a handheld device that has a diamond tip and an attached vacuum. Newer methods include topical medications during the procedure to increase absorption and improve results. Results of microdermabrasion are similar to those of light chemical peels and the results are not great as it only goes as deep as the epidermis. Mild redness occurs after treatment but otherwise there is minimal downtime after this procedure. For best results 5 or 6 treatments may be needed every 1 to 2 weeks. Follow your doctor's instructions about how to take care of your skin after you go home. Doing so helps your skin heal and prevents complications such as infection. Dermabrasion combined with laser resurfacing is called lasabrasion. Lasers are an effective tool for eliminating wrinkles. One advantage of lasers over other resurfacing methods is their ability to tighten the skin. A successful procedure can make people look 10 to 20 years younger, and the results can last for up to 10 years. The procedure helps most around the eyes, nose, and mouth, and can also be done on the neck. Laser therapy can also be effective for acne scars, spider veins, and age spots that are widespread on the face. When used alone, laser therapy may not completely eliminate crow's feet and other wrinkles, broken blood vessels, or dark circles under the eyes. Therefore, some doctors combine different laser techniques depending on the skin problem. Other treatments, such as dermabrasion, may also be combined with laser treatments. (A laser and dermabrasion combination is called lasabrasion.) Pretreatment with botulinum toxin injections before laser resurfacing, for example, may also improve the treatment of crow's feet. Standard laser dermabrasion is too harsh for thinner skin layers such as on the neck. Gentler laser techniques, however, stimulate collagen without removing skin layers and may be useful for necklines. Laser resurfacing is not recommended for people with very sensitive skin and who cannot tolerate the necessary medicines and skin lubricants. A test area may be necessary to test if the laser is appropriate for a larger area. Ablative lasers treat the skin by damaging and removing the skin layers so that new skin can grow. The two types of lasers are: The CO2 laser delivers short pulsed energy or continuous energy into the skin. CO2 laser works well for more severe wrinkles, age spots, scars, and other skin problems. The Erbium (Er:YAG) laser delivers high energy beams in pulses. This laser is gentler than other alternatives. It is effective for mild wrinkles and for providing a smooth skin texture but has less impressive results than the CO2 lasers. It is also used to treat skin blemishes that result from blood vessel abnormalities, such as port-wine stains. Fractional ablative lasers are slightly newer and less invasive. With this method, tiny columns of skin are treated, rather than a large part of the skin surface. This is an approach in between traditional ablative and non-ablative methods. Side effects and recovery time are less compared to traditional ablative resurfacing. Non-ablative lasers treat the skin by stimulating collagen to grow. These lasers do not damage and remove the skin. Treatment is aimed at a smoother and more even appearance. Many types of non-ablative lasers are available. Depending on the type of laser your doctor uses, your doctor can tell you how effective it is for your skin problem. It is less invasive, but results may not be as strong as ablative methods. This technique requires multiple treatments. You may receive pain medicine. This is to keep you relaxed and comfortable during the procedure. Daily application of tretinoin for several weeks may prove helpful for recovery and results. Energy in the form of light pulses from the laser penetrates the skin quickly. The top skin layers are damaged without damaging the deeper layers. This promotes the growth of new skin. The laser delivers enough energy to shorten collagen fibers, restoring some elasticity to the skin. Energy from the laser is very focused, so surrounding skin and tissue are not damaged. Right after the procedure, a dressing is applied to the treated area. The dressing protects the skin. It is left on for 3 to 4 days. Follow instructions exactly about how to care for your skin at home. Healing usually occurs in 7 to 10 days. Let your provider know about any history of herpes simplex on your lips or face as you may need antiviral prophylaxis. The redness, swelling, and irritation that occur during the healing process can be severe. Laser resurfacing that only removes thin layers of skin does not have the same severe after-effects as other laser treatments. For 8 to 9 days, the face looks skinned and swollen. During this time, continuous moisturizing and gentle washing is needed to prevent infection. Redness and sensitivity can last for 1 to 4 months. Exposure to sun must be avoided as much as possible during this time and in the future to prevent further skin damage. Sunscreen of SPF 30 should be applied daily. Risk of complications from ablative laser resurfacing depends in part on the surgeon's experience. Scarring and infections develop in about 1% of procedures. People with a history of herpes simplex may experience flare-ups of fever, facial pain, and flu-like symptoms for 5 to 6 days after the procedure. People with darker skin may need to avoid the procedure, because it can cause changes in skin color or uneven skin color. This method is also called cold ablation, or coblation for short. It is used mainly for early wrinkles on the forehead or around the eyes or mouth. Coblation uses radiofrequency energy. This energy is a much lower temperature than that of laser energy. Coblation heats the deeper layer of skin. This causes the collagen to contract, improving the appearance of wrinkles. Intense pulsed light (IPL) uses filters to deliver different wavelengths of light to the skin. IPL is used to treat a number of photoaging skin problems, and it appears to have long-term effects. Typically, 4 to 6 treatments are performed over a 4-month period. Each treatment takes 15 to 20 minutes. Unlike laser light, which uses one color wavelength (such as green or red), intense pulsed light starts with a full spectrum of light. The doctor can then block off specific wavelengths depending on how shallow or deep the treatment. Injectable skin fillers are a common means of reducing wrinkles and folds. Fillers can also be used for depressions under the eyes as well as acne and other concave scars. The procedure usually involves using a tiny needle and syringe to inject the filler material under the skin of the area to be treated. The aim of fillers is to replace tissue volume that has been lost due to aging or illness. For example, fillers are used to enhance the lips to make them fuller. The process is also referred to as soft tissue augmentation. The fillers are often used along with other agents, such as botulinum toxin to reduce wrinkles. Filler types can differ by placement, or how far into the layers of the skin they are injected. Depending on how long the effects last, fillers are also divided into temporary (<6 months), long-lasting (6 months to 2 years), semi-permanent (2 to 5 years), and permanent (>5 years) types. There are over 20 fillers approved for use in the US, and the list of options continues to grow. You and the doctor discuss the areas you would like treated. The doctor assesses the appearance of your face and your skin type. The doctor marks the points on your face where injections will be made. Your skin is cleansed to remove bacteria. Pain medication (and sometimes ice) is applied to your skin 15 minutes before the procedure. Some fillers have pain medication in them. Sometimes nerve blocks or local anesthesia is used. The filler is injected with a tiny needle. There are several techniques that may be used, including quick, short punctures along the fold, or full-length needle insertion and a slower deposit of filler. The doctor may massage the filler into the skin. The marks are cleaned. You may be given an ice pack to apply to the treated area. Use it as instructed. Follow instructions about how to take care of your skin after you go home. Keep any follow-up appointments as instructed. Botulinum toxin products (Botox, Myobloc, Dysport, Xeomin) are used to smooth wrinkles that are formed over the years by muscles that are active when you make facial expressions. Thus, these products keep your face looking like it is at rest. Forehead furrows, frown lines, and crow's feet are the kinds of wrinkles that botulinum toxin treats successfully for a short period of time. Botulinum toxin is a substance made by a bacterium and purified before it is used for cosmetic purposes. This toxin temporarily paralyzes muscles. To smooth wrinkles, tiny amounts of the substance are injected where the muscles contract. This blocks the muscles from contracting thus reducing wrinkles or even causing them to temporarily disappear. Botulinum toxin injection should not keep you from making normal facial expressions. It only relaxes the muscles that link to the wrinkles that are being treated. Botulinum toxin is indicated for people 18 to 65 years old, whose wrinkles are just starting to form. Because it is not a filler, botulinum toxin does not work for deep wrinkles not due to muscle contraction, which are common in older people. Improvement is noticed about 1 week after the injections. Injections need to be repeated every 3 to 4 months because the effects wear off. Repeated use is generally safe and effective. Before treatment, tell your doctor if you are allergic to eggs because botulinum toxin is prepared with an egg base. Pregnant women are advised not to receive botulinum toxin injections. The doctor asks you to make facial expressions. This helps the doctor determine which muscles are causing the wrinkles you want treated. The doctor may mark the points on your face where injections will be made. Pain medicine may be applied to your skin. Botulinum toxin is injected with a tiny needle. Each injection takes a few seconds. If marks were made, they are cleaned. Follow instructions about how to take care of your skin after you go home. You may be told not to lift anything heavy, lie down, or bend over. This is to prevent the treated area from bruising or bleeding. Moving the injected muscles will allow the botulinum toxin to disperse more effectively. Botulinum toxin injection is generally safe and effective. Your doctor can tell you the risks and complications of botulinum toxin injections. Cosmetic surgery is surgery done to improve a person's appearance. Aging causes the skin and tissues of the face to lose firmness. As a result, the skin and tissues sag, causing wrinkles. Cosmetic surgery can correct such wrinkles. Main types of cosmetic surgery for wrinkles of the face and neck are facelift, forehead lift, and neck lift. Facelift surgery is also called rhytidectomy (rhytid means wrinkle). The degree of improvement after surgery depends on many factors, including age, bone structure, skin type, and lifestyle habits such as smoking and sun exposure. You and your doctor will discuss the areas you would like improved. Be sure you understand the amount of improvement to expect after surgery. Simple facelift surgeries are done in a doctor's office under local anesthesia. More involved surgeries are done in a hospital under general anesthesia. Superficial musculoaponeurotic system (SMAS) rhytidectomy. The most common facelift procedure. The surgeon makes incisions at the hairline and gently separates the skin from the underlying tissue and muscles. The muscles are tightened and excess fat and tissue, such as fat under the chin and neck, are removed. This surgery is done to improve the entire face. Variations of the SMAS procedure are done depending on the area of the face and depth of tissue to be treated. For instance, a limited incision technique may only include small incisions at the temples, ear, and eyelids. Deep-plane rhytidectomy may also be done, but not as frequently as SMAS rhytidectomy. A less invasive surgery. It is usually done on specific areas of the face. Small incisions are made in the skin. An endoscope is inserted into the incision. The endoscope is a slender tube with a tiny camera and light on the end. It allows the surgeon to view the tissue and structures underneath the skin. The surgeon then removes excess fat and repositions muscles and tissues. Unlike the SMAS procedure, flaps of skin are not cut away. Your doctor can tell you which procedure is appropriate for you. Recovery lasts several weeks to several months. With endoscopic facelift, scarring is minimal and recovery is usually faster than with the SMAS procedure. With either procedure, swelling and discoloration are common. There may be tingling or numbness, which go away as damaged nerves regenerate. To speed healing, your doctor will likely instruct you to avoid activity for a few days. You may also be told to keep your head elevated on pillows while lying down and apply cold compress to the incision areas. This helps reduce swelling. Follow any other instructions on how to care for yourself at home. Keep all follow-up appointments. Stitches may need to be removed after the procedure. Complications are rare, especially with a skilled surgeon. But the more complex the facelift, the greater the risk of complications. Forehead lift is also called brow lift. This is surgery that improves wrinkles on the forehead, including the horizontal wrinkles and vertical wrinkles between the eyebrows. It can also improve crow's feet wrinkles at the outer corners of the eyes. Surgery can be done using long incisions (open procedure). Or it can be done using smaller incisions (endoscopic procedure). During the traditional procedure, incisions are made from ear to ear across the top of the hairline and the skin is pulled back. There are several modifications to the traditional forehead lift that may be safer and just as effective, such as a trichophytic brow lift. Options will depend on your needs and hairline. Forehead lift can be performed alone or along with other cosmetic procedures such as blepharoplasty (eyelid surgery), where the folds of the eyelids are cut, shortened, and reattached for a wider opening and more youthful look. Recovery and complications are the same as for facelift surgery. Wrinkles that appear on the neck during aging are due to sagging skin and muscles and excess fat. Surgery can reduce neck wrinkles and improve the overall appearance of the neck. The surgeon makes incisions behind the ears or under the chin or both. The neck muscle called the platysma is straightened. Or part of this muscle is removed. The muscle is then stitched (sutured) to hold it in place. This tightens the neck and reduces wrinkles. This surgery can be done as an open or endoscopic procedure. The surgeon makes incisions behind the ears or under the chin. Excess neck skin is then removed. As a result wrinkles are reduced. The surgeon makes an incision below the chin. A tube (cannula) is inserted into the incision. The surgeon uses the tube to gently break up excess fat. The tube is attached to a machine that removes the fat. Liposuction may be combined with platysmaplasty or cervicoplasty. Recovery process is the same as for facelift described above. You will likely be prescribed medicines to reduce pain and prevent infection. To reduce swelling, you may be told to keep your head elevated on pillows while lying down. You may also wear an elastic head and neck bandage. Follow any other instructions about caring for yourself at home. Keep all follow-up appointments. Complications are the same as for facelift described above. Infection, bleeding or excessive blood loss, or permanent nerve injury. Azizzadeh B. Reshaping rhytidectomy. In: Azizzadeh B, Murphy MR, Johnson CM, Massry GG, Fitzgerald R, eds. Master Techniques in Facial Rejuvenation. 2nd ed. Phildelphia, PA: Elsevier; 2018:chap 19. Bradley EJ, Griffiths CE, Sherratt MJ, Bell M, Watson RE. Over-the-counter anti-ageing topical agents and their ability to protect and repair photoaged skin. Maturitas. 2015;80(3):265-272. PMID: 25616779 www.ncbi.nlm.nih.gov/pubmed/25616779. Broadbent T, Mohktarzadeh A, Harrison A. Minimally invasive brow lifting techniques. Curr Opin Ophthalmol. 2017;28(5):539-543. PMID: 28505033 www.ncbi.nlm.nih.gov/pubmed/28505033. Costa IMC, Damasceno PS, Costa MC, Gomes KGP. Review in peeling complications. J Cosmet Dermatol. 2017;16(3):319-326. PMID: 28349655 www.ncbi.nlm.nih.gov/pubmed/28349655. Derby BM, Codner MA. Evidence-based medicine: face lift. Plast Reconstr Surg. 2017;139(1):151e-167e. PMID: 28027252 www.ncbi.nlm.nih.gov/pubmed/28027252. Fallacara A, Manfredini S, Durini E, Vertuani S. Hyaluronic acid fillers in soft tissue regeneration. Facial Plast Surg. 2017;33(1):87-96. PMID: 28226376 www.ncbi.nlm.nih.gov/pubmed/28226376. Farris PK. Topical skin care and the cosmetic patient. In: Azizzadeh B, Murphy MR, Johnson CM, Massry GG, Fitzgerald R, eds. Master Techniques in Facial Rejuvenation. 2nd ed. Phildelphia, PA: Elsevier; 2018:chap 5. Han A, Chien AL, Kang S. Photoaging. Dermatol Clin. 2014;32(3):291-299. PMID: 24891052 www.ncbi.nlm.nih.gov/pubmed/24891052. Hanke CW, Tierney EP, Countryman NB, Rzany B, Sattler G. Soft-tissue augmentation. In: Robinson JK, Hanke CW, Siegel DM, Fratila A, Bhatia AC, eds. Surgery of the Skin. 3rd ed. Philadelphia, PA: Elsevier Saunders; 2015:chap 24. Kane MAC. Injectables and resurfacing techniques: botulinum toxin (BoNT-A). In: Azizzadeh B, Murphy MR, Johnson CM, Massry GG, Fitzgerald R, eds. Master Techniques in Facial Rejuvenation. 2nd ed. Philadelphia, PA: Elsevier; 2018:chap 4. Mancuso JB, Maruthi R, Wang SQ, Lim HW. Sunscreens: an update. Am J Clin Dermatol. 2017;18(5):643-650. PMID: 28510141 www.ncbi.nlm.nih.gov/pubmed/28510141. Mangat DS, Harmych BM, Been MJ. Rhytidectomy and facial liposuction. In: Flint PW, Haughey BH, Lund VJ, et al, eds. Cummings Otolaryngology. 6th ed. Philadelphia, PA: Elsevier Saunders; 2015:chap 27. Nassif P, Griffin G. The aesthetic brow and forehead. In: Flint PW, Haughey BH, Lund VJ, et al, eds. Cummings Otolaryngology. 6th ed. Philadelphia, PA: Elsevier Saunders; 2015:chap 28. Perkins SW, Waters HH. Management of aging skin. In: Flint PW, Haughey BH, Lund VJ, et al, eds. Cummings Otolaryngology. 6th ed. Philadelphia, PA: Elsevier Saunders; 2015:chap 26. Rauscher GE. Esthetics and plastic surgery. In: Aschheim KW, ed. Esthetic Dentistry: A Clinical Approach to Techniques and Materials. 3rd ed. St Louis, MO: Elsevier Mosby; 2015:chap 25. Zins JE, Morrison CM, Langevin C-J. Neck rejuvenation. In: Rubin JP, Neligan PC, eds. Plastic Surgery Volume 2: Aesthetic Surgery. 4th ed. Philadelphia, PA: Elsevier Saunders; 2017:chap 13.